When capturing attendance data with codeREADr, an administrator can hold an iOS or Android OS device to scan the IDs of the attendees. That’s the most common method. In other use cases, an iOS or Android OS device can be placed in a fixed position for the attendee to self-scan, with or without an administrator monitoring the process. In such setups, the codeREADr app is typically placed in the Kiosk Mode and the tablet’s front camera used for scanning. Because front cameras don’t have autofocus, the ideal credential is a QR Code without a lot of information embedded in it (for example, 8-20 alphanumeric characters). [Update 4-25-2018: When testing the “ASUS Chromebook Flip C101 PA” convertible laptop, scanning with the built-in, front-facing webcam quickly scanned any barcode we tried so far. We paid $229 and downloaded the codeREADr app directly from Google Play. Perhaps a good candidate for self-scanning applications. 1. 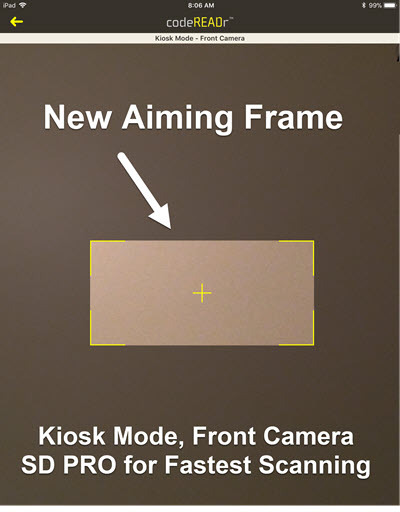 Use the rear camera which almost always has autofocus. You might want to set up a visual guide for the attendee so they know where to place their ID. This item came right out of the box in the Keyboard Emulation mode (HID) with continuous scan and a carriage return suffix enabled. It scanned well but not flawlessly. It will only scan linear 1D barcodes (e.g. Code 39, Code 128, UPC/EAN, etc). It will not scan 2D barcodes (QR codes, DataMatrix, etc.). You can see a 12-second demo video here. 1. The scanning accessory should be configured for the keyboard emulation mode with a carriage return suffix. Those are typical default settings for such scanners. If not, refer to the device’s manual for instructions. If the device supports submission of the scan as a complete string all at once (instead of one character at a time), that’s ideal for faster processing. 2. The codeREADr app can be open to the Tap to Scan screen or Manual Entry screen. When configuring the app on codeREADr.com, look for the option of the Advanced step to enable Auto Next Scan and to disable the camera. You can optionally also enable Kiosk mode there if needed.